Everywhere that's ever been in the Commonwealth. 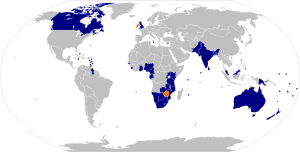 The Commonwealth of Nations is a collection of countries that used to be in the British Empire. It has a few differences from the empire, chief of which being that its members are independent states. Most countries once either ruled by or mandated to Great Britain, except the Arab states, Afghanistan, Burma, the United States, the Republic of Ireland, Israel/Palestine, and Somalia. Nepal and Bhutan, which were ruled as very loose British protectorates, are also not members. South Sudan applied for membership after its independence and it is likely to be admitted. A few other countries: Cameroon (Part of the country was mandated to the British after the Great War), Mozambique for some reason, and Rwanda, because Paul Kagame wanted to piss off the French. South Africa, Pakistan, Fiji, The Gambia. All its members are equal, rather than subordinate to the United Kingdom. Naughty members are expelled (that's Zimbabwe out then), but can rejoin when they play nice again - hello South Africa! Countries that liberated themselves from the British Empire, such as the United States or Ireland, are not members, but are still eligible. However, because it used to be that a country had to be a Commonwealth Realm (a constitutional monarchy recognizing the British monarch as its own monarch), and Ireland had had it with the monarchy, they aren't part of it, either, despite the fact that the Commonwealth changed the rules to allow republics to be members literally a week after Ireland left (to let in India). It's hard for an organisation that functions mainly as a club of friendly states to list any solid achievements, but it did manage to play a part in bringing apartheid to an end. Commonwealth membership creates a forum in which the leaders of smaller developing nations, who might otherwise have a hard time getting international attention, can deal one-on-one with bigger players such as Britain, Canada and Australia. The Commonwealth also supports a worldwide military framework, as the UK maintains naval bases in various member-countries. Many Commonwealth states are major customers of the British arms industry; loans from the British government may pay for this ordnance. The Commonwealth Games (formerly the British Empire Games, etc.) have taken place every four years, midway between the Olympic Summer Games, since 1930 (except for 1942 and 1946, because of technical issues). Even places like Norfolk Island (pop. 2,302 in 2011) turn up. Unlike the Olympics, they provide an opportunity for the UK home nations (England, Northern Ireland, Scotland and Wales) to take it out on each other. They typically function as an opportunity for Australia to always win. This page was last modified on 5 May 2018, at 10:25.